A sense of self worth is sometimes hard to come by, for many reasons. It could be due to a lost friendship, the betrayal of a spouse, the loss of a job, a rough childhood. But I think as much as anything it has to do with those around us. We tend to see ourselves the way we THINK others must see us. It feels like our failures are viewed by thousands and our successes are seen by ten people or so. If only we would remember how Christ sees us: valuable, worthy, loved, and thankfully, forgiven. Don't let the views or actions of a few make you question your value. And hopefully, our actions and words will not make others question theirs. They'll remember how we make them feel. 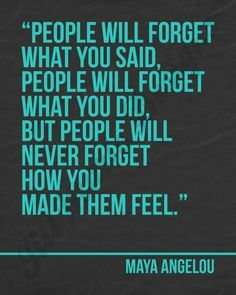 Maya Angelou knew exactly what she was talking about. A thought you've shared with me that has always stuck with me! :-) Thanks for your support!